When spoken, the word Artemisia rolls off the tongue with ease. This genus received its mellifluous moniker in honor of Greek Queen Artemisia whose name was in turn inspired by the Greek Goddess Artemis. But when faced with common names such as sagebrush, mugwort, wormwood and sandwort, gardeners may not be inspired to search these plants out in order to add them to their landscapes. 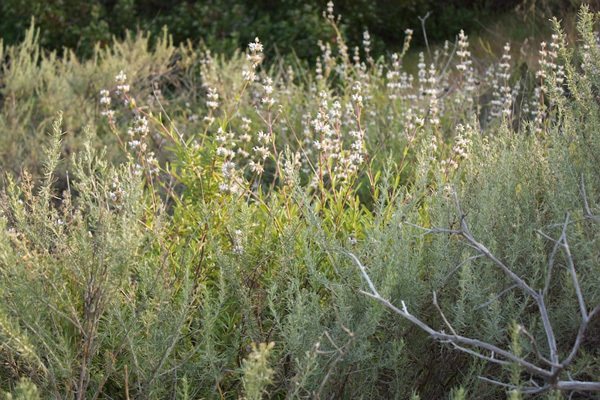 However, California Artemisia species can make an ornamental and often aromatic addition to native habitat gardens. Although species of Artemisia are members of the sunflower family (Asteraceae), they generally produce small inconspicuous flowers unlike many members of the family. 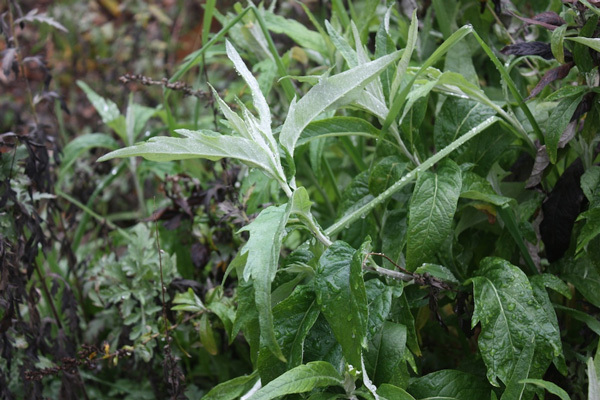 Their strong point in the garden is interesting silvery foliage that is often pleasantly fragrant when bruised. Essential oils in the stems and leaves are responsible for their usually pleasant aroma, which also discourages animal and insect pests. Flowering late in the season, they are an important source of food for local wildlife. Artemisia is found in many parts of the Old World and New World, and many species have been used in medicine, cooking and horticulture for hundreds of years in Europe, Asia and the Americas. 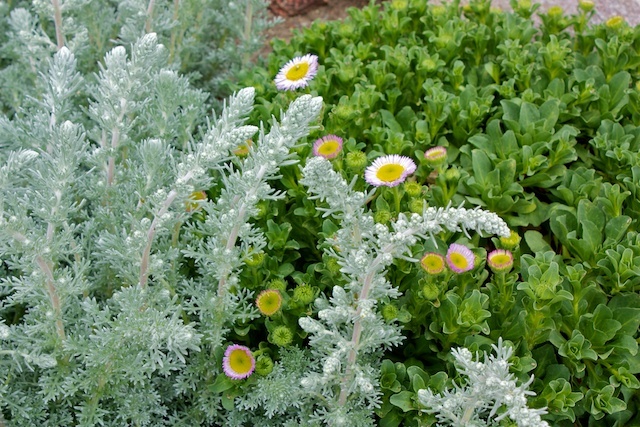 Due to its common name and sage-like aromatic foliage, California sagebrush is often mistaken for a true sage (Salvia). It is an important component of the coastal sage scrub habitat community and is often heavily relied upon in restoration projects. Plant it in full sun where it can grow to about 4’ high and 4’ wide. Once established, it will survive without supplemental water, but will look happier with the occasional deep summer watering. The finely divided gray leaves of sagebrush make a nice contrast with green foliage in the garden. Companion plants can include California buckwheat (Eriogonum fasciculatum), coyote brush (Baccharis pilularis) and black sage (Salvia mellifera). Sagebrush tends to become leggy with age and a hard pruning in early winter will keep it more compact. Artemisia californica ‘Canyon Gray’ is a prostrate cultivar that grows to only 1’ to 2’ in height but can spread up to 6’ in width with virtually no maintenance or water needed. Its low spreading habit makes it an excellent choice for erosion control and fire resistance. Ubiquitous in the Great Basin, this silver/gray shrub makes a fine, low maintenance specimen for mountain and desert gardens. In the harsh conditions of its natural environment, this long lived sagebrush usually grows to only 2 to 3 feet in height and width, but is capable of attaining twice that in a garden setting. 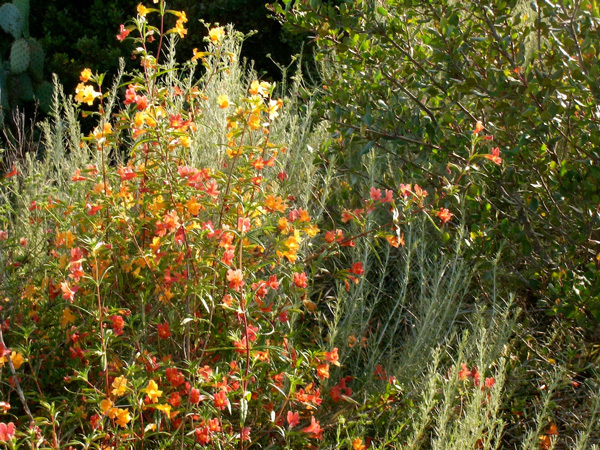 Combine with brittlebush/incienso (Encelia farinosa), desert sage (Salvia dorrii) and desert mallow (Sphaeralcea ambigua) for a naturalistic look. Light fall deadheading will improve its appearance and will release pleasant aromas making for an enjoyable activity. An important medicinal plant for Native Californians, mugwort is an under-appreciated garden perennial. Its leaves are green on the upper surface, light gray underneath and soft and aromatic to the touch. When rubbed on the skin, the leaves have a natural moisturizing effect and are said to counteract the oils of poison oak if applied immediately, which is handy since they are often found growing near one another. Mugwort thrives in dry or moist shade and grows to a height of 3’ to 4’ with many stems from a spreading root-base. It is fairly easy to dig runners if it gets too adventurous, or it can be contained within a planter. In a wild garden let it ramble and mix with California rose (Rosa californica), hummingbird sage (Salvia spathacea) and California fuchsia (Epilobium californicum). This selected variety from the coastal strand plant community is a dense silvery ground hugger that can grow to 3’ in diameter. Sun, sandy well drained soil and very occasional watering make it an excellent border plant or massed groundcover for gardens in the beach cities. Plant companions include seaside daisy (Erigeron glaucus), beach lupine (Lupinus albifrons) and mock heather (Ericameria ericoides). Planted at the base of Howard McMinn Manzanita (Arctostaphylos ‘Howard McMinn’), sandhill sage makes a beautiful contrast in silver, green and red colors. Tony Baker is horticulture co-chair of the South Coast Chapter of CNPS and owner of Natural Landscapes. Tony is a native plant landscaper who helps homeowners install habitat friendly gardens in the South Bay of Los Angeles County. ← And Then There Were Three! Regarding your quote here: “Once established, it will survive without supplemental water, but will look happier with the occasional deep summer watering.” My question: so it hasn’t shown any substantial ‘deep’ dry season watering fussiness, – rot susceptibility? More resistant to rot due to dry season watering than wild forms of Mimulus aurantiacus/puniceus/longiflorus, for example comparison? I just planted some A. pycnocephala ‘David’s choice’. I think it’s beautiful, but it’s not particularly fragrant, as I was expecting….